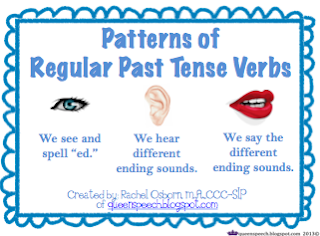 Patterns of Past Tense Verbs! I have some students who are able to easily memorize irregular verbs, but for whatever reason cannot remember regular past tense. 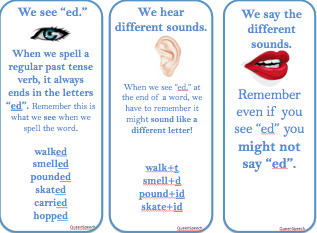 Some students are more visual and tactile, so I broke down the verbs in to what we see, hear, and say! I think seeing the difference between what we spell (because English is not clear with it's rules) and what we hear and say will help! Discuss with students the difference between what we see, hear and say (page 3). Practice learning the difference between quiet versus loud sounds (page 4). Go over the exceptions with the “t” and “d” sounds (page 5) . Discuss how we see and spell each verb ending on paper (spelling) (page 5-6). 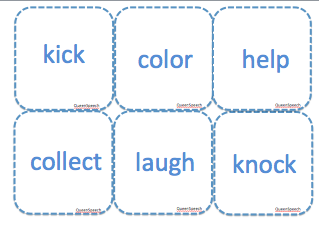 Verb Sound Slap Card Game (page 7)-print multiples of these! Instruct students practice slapping down the sound they hear at the end as fast as they can! See who can get the most correct. 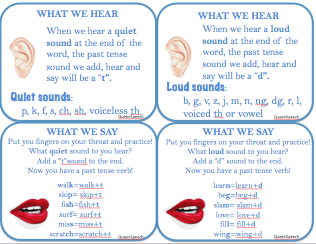 Then reverse, have students say the verbs.